SINGAPORE, Dec 4, 2018 - (ACN Newswire) - Emma Sheller, Global Head of Brand and Marketing of Standard Chartered and Vishnu Mohan, Chairman and Chief Executive Officer of Southeast Asia and India at Havas Group have been appointed as Heads of Jury for the 2019 APAC Effie Awards. They are the first two of eight Heads of Juries to join the Judging Committee, and will lead the jurors to review the most effective work from the region. As a seasoned marketer with diverse experience and a proven track record in improving brand awareness through innovative marketing and social media campaigns, Emma is responsible for driving Standard Chartered's overall brand and marketing strategy. Commenting on her appointment, Emma said, "We operate in an industry where change is the only constant and the Effie Awards define what the marketing industry should be - that we are not creating works for the sake of art but creating works that solve business challenges. I am delighted to accept the role as Head of Jury for the APAC Effie 2019 and look forward to reviewing the best works that the region has produced over the course of the last year". Vishnu's experience is grounded in agency transformation leveraging marketing communications, talent, culture and accelerated growth. He joined the Havas network in 2005 to take on the responsibility of setting up Havas Media in the Asia Pacific region, and under his charge the network grew to have over 2000 people. He took on his current position when Havas Group brought together all its communication disciplines under one roof to form Havas Villages in 2016. On his appointment, Vishnu said "Effectiveness is arguably one of the most important factors to consider when it comes to judging the success of a campaign and something we always strive to achieve in our industry. The Effie Awards stand for inspiring, effective work that drive results and I am both honoured and humbled to take on the role of Head of Jury for the 2019 APAC Effie awards. I look forward to working with my peers to reward great ideas that drive positive business outcomes as we review the best work the region has to offer". Organised by the Confederation of Asian Advertising Agency Associations (CAAAA) and Tenasia Group, APAC Effie Awards honours the region's most outstanding marketing communication works that have proven results in meeting strategic objectives. APAC Effie champions practices of marketing effectiveness excellence in the Asia Pacific region, and provides the growing industry with a regional platform where the best works are celebrated. Introduced by the New York American Marketing Association in 1968, the Effie Awards have since been recognised by advertisers and agencies as the pre-eminent award in the advertising industry and global standard of marketing effectiveness excellence. 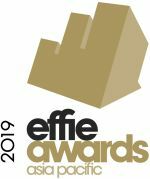 Today, Effie celebrates effectiveness worldwide with the Global Effie, the APAC Effie, the Euro Effie, the Middle East / North Africa Effie and more than 40 national Effie programs. CAAAA is a non-profit organisation established by advertising agency associations in Asia whose key mission is to further the business interest of advertising companies/agencies in the region. CAAAA works in close collaboration with stakeholders in the marketing communications industry across the region, including North, South and Southeast Asia, to support uniform professional standards and norms, and to enhance the profile and stature of the industry. Tenasia Group specialises in staging professional and influential industry events that inspire. Building on their expertise in delivering high-quality industry events, award shows and conferences, Tenasia's portfolio of businesses aims to provide a platform for the exchange of ideas and knowledge, shaping business opportunities in the region and celebrating achievements in specific fields.